Is there such a thing as a former Longhorn? These players will always be Longhorns to University of Texas fans, even though they’ve graduated to the next level of football. Every week we’ll update you on how they performed the previous weekend. Here’s a look at the Longhorns in the NFL and how they fared in Week 9. There are a lot of former Longhorns playing defense in the NFL, but the highlight of the week goes to one of the few former Longhorns playing offense. 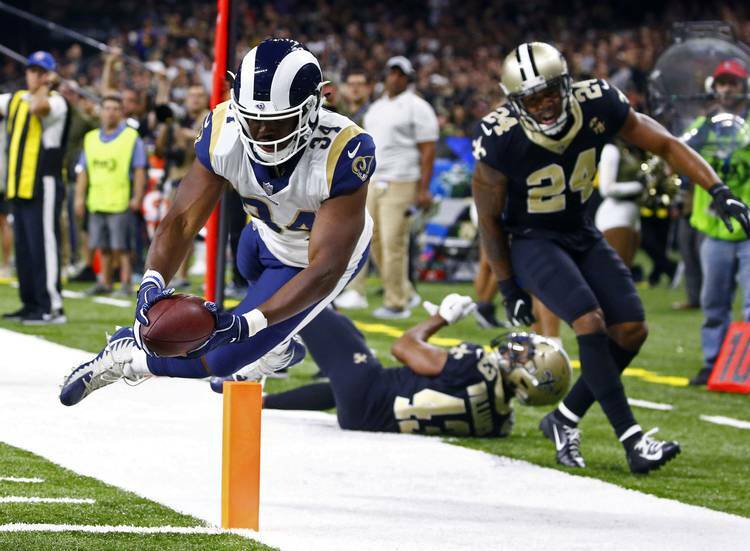 Malcolm Brown had just one touch in the big matchup between the Los Angeles Rams and the New Orleans Saints on Sunday night, but he made it count. The Rams trailed by 18 points before Jared Goff found Brown on the left side of the field. The running back made the catch and made a spectacular play to stay in bounds on the sideline in order to score and cut the lead to 35-23. The Rams eventually tied the game at 35-35 before the Saints pulled out the 45-35 win. Kenny Vaccaro returned to action in Week 9 after dealing with an elbow injury since September. He contributed six tackles in the 28-14 win over the Cowboys. Vaccaro’s run support helped the Titans hold the Cowboys to just 72 yards rushing. They held Ezekiel Elliott to just 61 yards and 3.6 yards per carry. A teammate of Vaccaro’s, Brian Orakpo, didn’t register a lot of stats. He did, however, log his first sack of the season, two quarterback hits and a batted pass in the win. Adrian Phillips, CB, Chargers—6 tackles in the 25-17 win over the Seahawks. Quandre Diggs, CB, Lions—4 tackles in the 24-9 loss to the Vikings. Holton Hill, CB, Vikings—4 tackles in the 24-9 win over the Lions. Marquise Goodwin, WR, 49ers—1 catch for 11 yards, 1 rush for 2 yards in the 34-3 over the Raiders. Malcom Brown, DT, Patriots—2 tackles and a half tackle for loss in the 31-17 win over the Packers. Michael Dickson, P – Seahawks— 6 punts, 52.8 avg, 4 inside the 20 in the 25-17 loss to the Chargers. Justin Tucker, K, Ravens—3 for 3 on field goals, 1 for 1 on extra points in the 23-16 loss to the Steelers. Connor Williams, G, Cowboys—19 rushing attempts for 72 team rushing yards and five team sacks given up in the 28-14 loss to the Titans. Colt McCoy, QB, Redskins—Backed up Alex Smith in the 38-14 loss to the Falcons. Geoff Swaim, TE, Cowboys—Inactive (knee) in the 28-14 loss to the Titans. Tyrone Swoopes, TE, Free Agent— Cut by Seahawks on Oct. 27, cleared waivers Oct. 29, released from Seahawks practice squad Tuesday. D’Onta Foreman, RB, Texans— PUP. Week 7 was the first week Foreman was eligible to be added to the active roster. His Texans beat the Broncos 19-17. Week 1, Week 2, Week 3, Week 4, Week 5, Week 6, Week 7, Week 8.